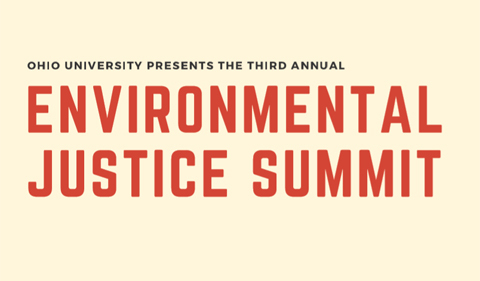 Tuesday, April 2, marks the beginning of the third annual Environmental Justice Summit at Ohio University. Sponsored by Student Senate’s Environmental Affairs Commission and the Ohio University Sierra Student Coalition, the event promotes awareness of environmental justice, local food availability, and sustainability. The free events run from April 2 to 4 and include a variety of interactive activities. On April 2, students and community members can experience a local food fair from 2:30 to 4:30 p.m. on the fifth floor of Baker Center. There will also be an event held in the Jeff Market Culinary Studio entitled “Cooking with Local Ingredients,” taking place from 6-8 p.m.
On April 3, Alden Library hosts the event “Storytelling through Filmmaking” in Room 319 from 1 to 4 p.m. “Open Dialogues: Environmental Justice” will be held from 5 to 6:30 p.m. in the CoLab on the third floor of Alden Library. Finishing up Wednesday’s activities is a documentary screening at the Athena Cinema from 7 to 9 p.m.
On April 4, there will be an Environmental Activism Panel in Ellis Hall 019 from 4 to 5:30 p.m. Finishing up the Summit events is a keynote speech by Dr. John Francis from 7 to 9 p.m. at the Athena Cinema focusing on activism. Allison Shryock, a sophomore in HTC environmental studies, heads the Environmental Affairs Commission. The Environmental Justice Summit is the largest event led by this commission, and student engagement is key for its success. “We have a variety of events to appeal to as many people as possible, anyone who is interested can come,” Shryock explains. “Students will learn about the importance of local food, local businesses, as well as environmental activism.” The Summit includes motivators to attend, other than curiosity about sustainability, “Many of the events are hands-on, or have free food,” she said. Year-round, the commission strives to teach students about why they should care about sustainability while students at Ohio University. “Sustainability is an important topic that a lot of students don’t know a lot about or don’t know why it’s important,” Shryock states. The goal of the summit is to ensure inclusiveness and education. No experience is required to attend the events, and everyone is encouraged to take part, including non-student Athens community members.